Financial statements present meaningful information about a firm’s business activities (investing, financing, or operating activities) to the firm’s stakeholders (owners, lenders, regulators, employees). If you want to be a successful investor or entrepreneur, you should know how to interpret the numbers found in these financial statements and how you can use the information to make better business decisions. One of the most important financial statements is the balance sheet, which presents a snapshot of the investing and financing activities of a firm at a moment in time. It shows a list of assets that the firm owns, and the sources of capital used to finance these assets. On the left-hand side of Narra’s balance sheet, we see a list of the firm’s assets—resources with the ability or potential to provide future benefits to the firm. Assets are often listed based on liquidity, or the ease by which these assets can be converted to cash: liquid assets like cash, accounts receivable (unpaid bills of customers), and inventories are referred to as current assets (assets that can be converted to cash within one year); illiquid assets like heavy machinery, equipment, land, and production facilities are referred to as fixed or noncurrent assets (assets that cannot be easily converted to cash). The right-hand side of the balance sheet shows where the money used to buy the firm’s assets comes from. Liabilities are funds that come from the firm’s suppliers, creditors, and other stakeholders like the government and the firm’s employees. Narra’s liabilities include the firms’ unpaid bills to suppliers or accounts payable, and short- and long-term debt. Like assets, liabilities are also often classified as current (obligations that the firm must repay within the year) or noncurrent (long-term debt). A portion of the capital used to finance the firm’s assets come from the owners of the firm themselves. The owners’ stake in the firm is called shareholders’ or owners’ equity, and is found on the right side of the balance sheet below the liabilities. Shareholder’s equity includes funds contributed by the owners since the firm’s inception (common stock) and accumulated funds generated by the company’s operations that was reinvested into the firm (retained earnings). 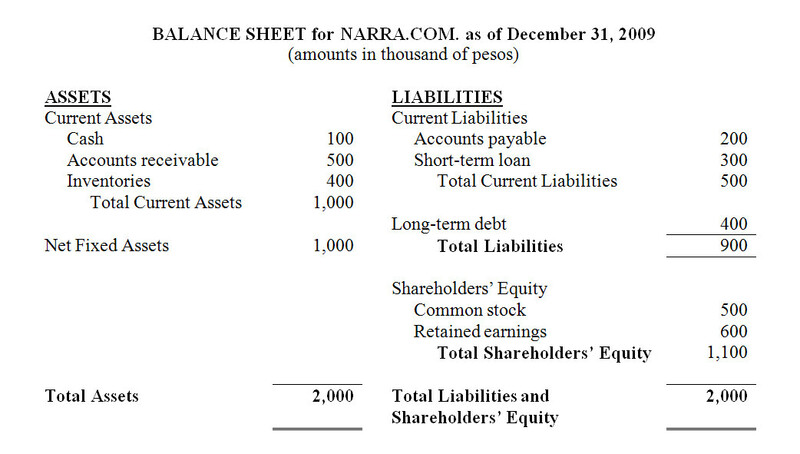 Take a look at the bottom portion of Narra’s balance sheet. What do you notice? That’s right: total assets equal total liabilities and shareholder’s equity! The balance sheet also tell us how much the company is worth, on paper (because actual buyers may think otherwise): Narra’s balance sheet shows us that the book or historical value of its assets, or the firm as a whole, is 2 million pesos, and that the company’s creditors have supplied 900,000 pesos of that amount (Total Liabilities). The company’s owners are entitled to whatever remains after satisfying the claim of creditors; in this example, owners only have a claim on 1.1 million pesos of the firms’ assets, basically because they supplied only that much capital to the company (Total Shareholder’s Equity). To summarize, the balance sheet provides very useful information about the current size of the company in terms of its assets, the firm’s overall liquidity, and how the firm uses available sources of financing like liabilities and owners’ equity. Looking at several years worth of balance sheets will provide even more meaningful and useful information, like the rate at which the company grows and trends regarding the company’s liquidity and financing position. Knowing the balance sheet and the different kinds of information that it provides is very important in investing and entrepreneurial success; it helps us better understand a firm we want to invest in or one that we already own. The next step is to know how to use this information to make more informed decisions that would create more value for the business and more wealth for ourselves.